The decision to roundly condemn Russia for its persecution of LGBT citizens seems a straightforward one, even when you bring the Sochi Olympics into it. That is, until someone points out that President Obama appointed Brian Boitano to his Sochi delegation, a figure skater who came out after Olympic career was over, and when the current Olympic figure skating team has no out competitors on it. In a long, comprehensive article, Newsweek examines the sport's sexuality paradox, where the sport's judges, officials, and performers are all pressured to play up its masculinity, and while male skaters are accused at all levels of being gay and therefore effeminate. Compounding that superficial, global "bias" is the very nature of figure skating: It is predicated on making the seemingly impossible look easy - leaping high in the air, landing triple and quadruple jumps, spinning at dizzying speeds, and doing it all with grace and emotion. Yet the subjective, artistic nature of figure skating means that it is often perceived to be a "softer" sport. A more graceful sport. In other words, a sport for girls. When female skaters perform, wearing sparkly, rhinestone-studded costumes, their hair and makeup flawless, that image lines up with our cultural norm of what it means to be female. Generally thin and attractive, and dressed in body-hugging costumes, these women appear suggestive without being overtly sexual. When men don sequins or rhinestones - and spin and twirl and artfully dance to music - what we see does not line up with the cultural definition of manliness. This leads to people seeing figure skating, as well as other girly sports like cheerleading and gymnastics as "cheesecake," even with the amount of skill it takes to pull off the athletics AND the poise. For male skaters, the successful ones are slotted into being "athletic" (pulling off a quadruple lutz or other fancy jump) or "artistic" (Johnny Weir). One or the other. Never both. 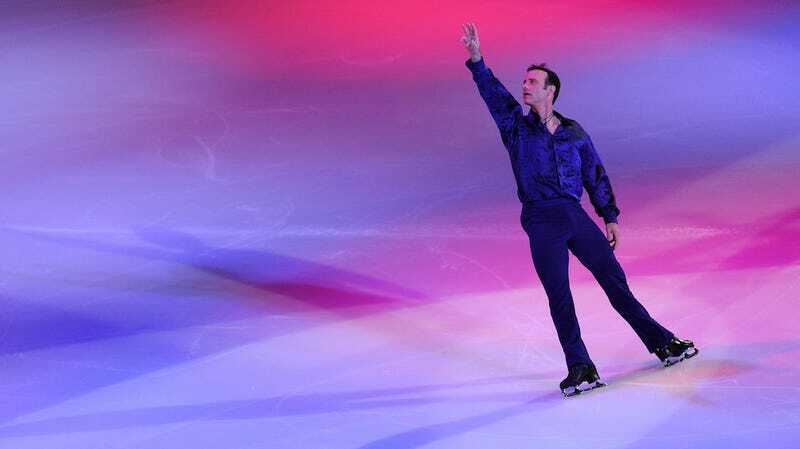 Former skaters allege that officials encouraged typecasting like this, and for everyone to play up the sport's masculinity to increase its marketability, a consideration that has also affected the role that race may or may not play in determining Olympic figure-skating team members. And this has real-world consequences for men beyond the rink. As an amateur, skaters like Brandom Larcom have had to fight insinuation about their sexuality from a young age. The Newsweek article quotes sports sociology professor Mary Louise Adams as saying, "Lots of boys sign up for skating because they want to wear sparkly costumes. Then they find out when they get older, 'Let's try to keep the sparkle down, because that's feminine and then they'll think you're gay.' And of course, they're saying that to some boys who are gay." No wonder so few gay figure skaters come out — and those that do wait until retirement.